To better understand the dining room, consider it as a blend between a kitchen and a living room. Or in other words, a room that needs to be functional, and at the same time cosy and inviting. And what better way to achieve this than with the help of Scandinavian style. Scandinavian interior style is the art of creating simple yet purposeful spaces that ooze with comfort and warmth. When well designed, a Scandi-inspired dining room can certainly be a charmer. Here are a few tips on how to create one of your own. There aren’t many guidelines to stick to when looking for the right pieces of furniture for your Scandinavian dining room. Elegant and simplistic designs are more than welcomed. But most importantly, Scandinavian dining areas are characterized by multifunctional furniture, like for instance, a dining table that is extendible and includes drawers. 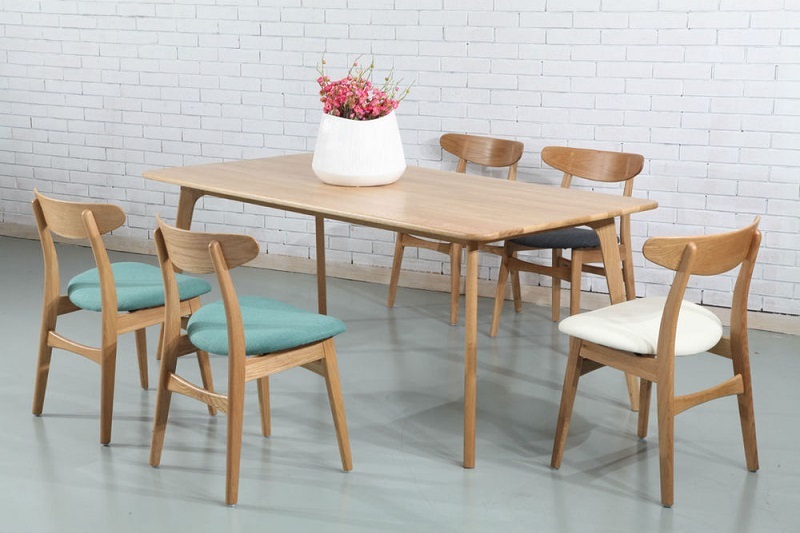 Natural materials are another characteristic of the Scandinavian dining room, with furniture usually made of quality woods like oak, maple, walnut or ash which guarantee durability. What’s more, it’s not strange to come across various storage solutions in the form of cabinets, drawers integrated in the table, console tables, baskets and other things. This style hates clutter and likes to keep things to the minimum. Colour is of the most defining aspects of Scandinavian style. In the world of interior design, there hasn’t been a style that loves so much white – and for a very good reason too. The whiter, the wider. Crisp white walls, an ivory dining table, pearly white counter tops can all make the space feel open and airy. Other popular colours include beige, light shades of green, soft brown, baby pink, amber-yellow and of course, pastels. The mix of white with these warm, light colours, creates a sunny and cosy atmosphere in the dining room despite the weather outside. Floors also greatly contribute to the feeling of openness in Scandinavian dining rooms, so don’t expect to see any wall-to-wall carpeting. A single area rug in geometric patterns or a pastel colour under the table can be just enough. The usual flooring choice is hardwood, or laminate as a more affordable option. The floors can have their natural brown colour or can be painted in white. As a space that embraces brightness, the Scandinavian dining room cannot get enough of light, whether natural or artificial. This explains why this style so often lacks curtains or blinds. As for artificial lighting, consider hanging a large chandelier over the table which can provide functionality and drama to your space. Additionally, you can include small, romantic fixtures such as wall sconces, or floor lamps. Candles are a great way to capture that hygge feeling Scandinavians love so much.